English boot house is one of the pioneers in Pakistan’s Footwear industry. Our first movers advantage has given us a credible standing in the Pakistani Market. EBH (English Boot House) has been up and running for over 7 decades; and through this time we have gained and maintained the public’s trust. We have shops spread out throughout the main areas of the City of Lights: Karachi. EBH has a global recognition and is commended for its stylish and elegant designs with no compensation when it comes to Comfort and Quality. Our online presence has been maintained through third party websites such as Daraz.pk and directly through ebhfashion.com. Our offerings include products for Men, Women and Children. U.S. Consulate General Karachi The picture still hangs at one of the English Boot House outlets in Karachi. 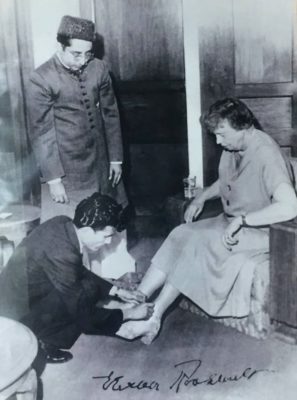 It was taken in February 1952, when Eleanor Roosevelt, widow of US President Franklin D. Roosevelt visited Pakistan for 10 days and was presented with these beautiful, embroidered sandals by Mr. Hamid Mian, Managing Partner of English Boot House as a gift. The first lady greatly admired Pakistani artisans for creating high quality work. Wonderful memories! Shipping Charges: We have devised the most feasible pocket friendly shipping charges for our international customers. Customers residing in Gulf Countries have an added advantage as the distance is minimal. Within Pakistan our customers do not have to bare any shipping charges and just have to pay for the product. Cash on Delivery options are available so just a few clicks and your choice would be at your door step. We welcome you to browse our portal and do give us your feedback about your experience and do advice us what we can do to further aid our customers for a pleasant shopping spree. If you have any further queries please feel free to drop an e-mail at info@ebhfashion.com.